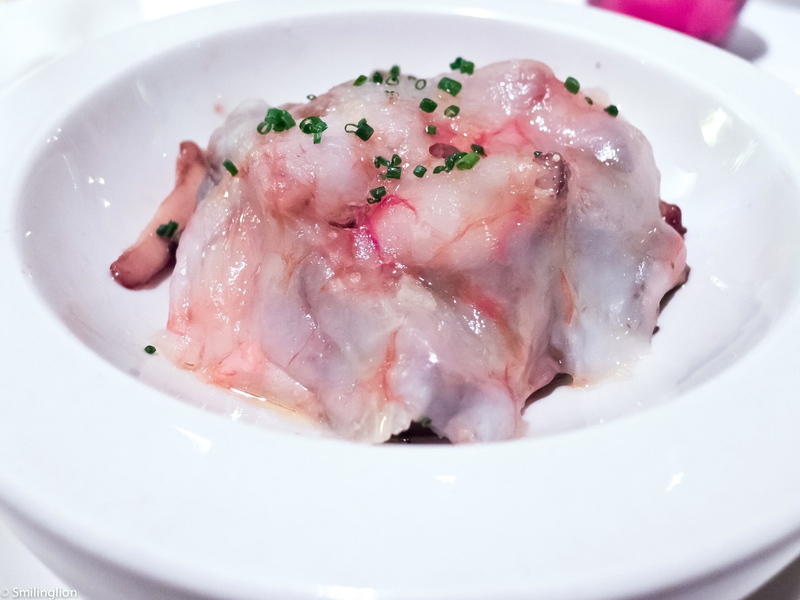 Outside of Spain, it seems like few people talk about the dining in Madrid. 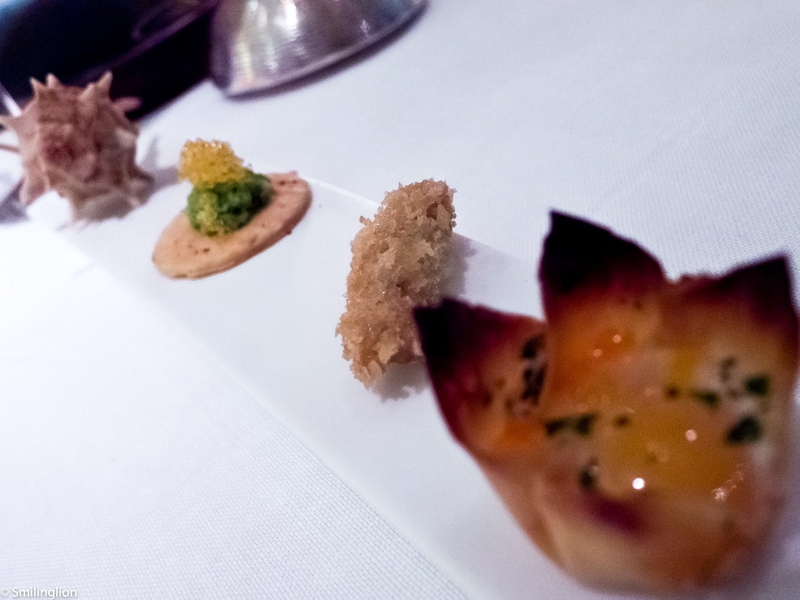 Instead, Barcelona (and its neighbouring regions, like Girona which has been in the spotlight because of El Cellar de Can Roca and previously, El Bulli) and San Sebastian dominate discussions between foodies when they compare notes about eating in the Iberian peninsular. 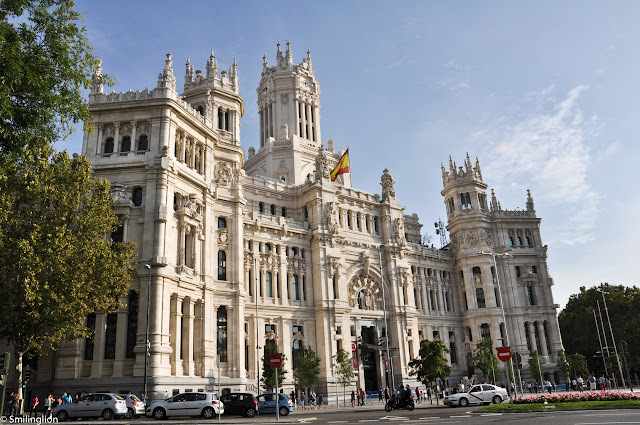 For that reason, when we planned our Spain trip this year, we found curiously sparse English material online when looking for where to eat in the Spanish capital. But that is not to say that Madrid has any less of a food culture than the other two above-mentioned cities. In fact, in our conversations with the locals in various parts of Spain during our trip, it seems like Madrid can more than hold its own when it comes to its gastronomy, and the restaurant in grand capital of Spain most talked about by the locals we spoke to outside Madrid was Santceloni. Santceloni is a two Michelin starred Spanish restaurant in the basement of Hotel Hesperia along Paseo de la Castellana, the main artery of the business and financial district of the capital of Spain. 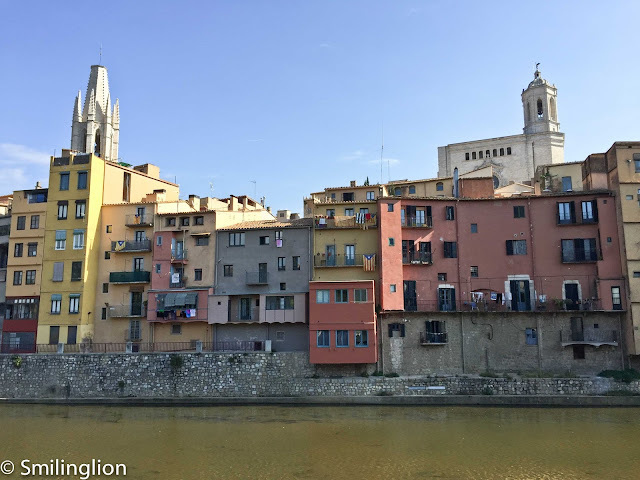 It was opened just over a decade ago, sponsored by Santi Santamaria of Can Fabes together with Hotel Hesperia, and named after the small town in which Can Fabes is located. 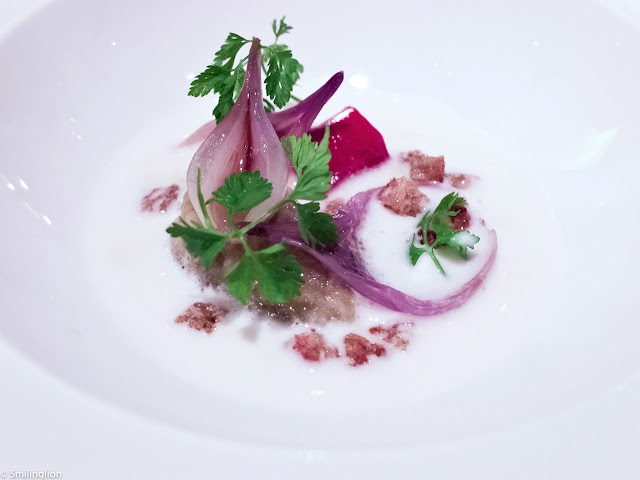 Chef Santi staffed it with a group of young chefs trained in the iconic restaurant in Sant Celoni, led till today by one of Spain's top chefs, Oscar Velasco. Though we do not know what the current ownership structure of this restaurant is, or if the Santamaria family still holds any interest in it, but what was clear to us when we went there was that Chef Santi's influence could still be seen everywhere, especially in the interior decor. The main sign of Santceloni was written in a handwriting style not dissimilar to Can Fabes and Santi in Singapore, and the use of old unfinished and rough-cut wood everywhere was another common theme. The service we got at Santceloni was outstanding. We were asked by the sommelier whether we wanted a glass of cava or champagne, a bottle of wine or just a glass of wine instead, without any direct or indirect pressure on us to order more than we wanted. 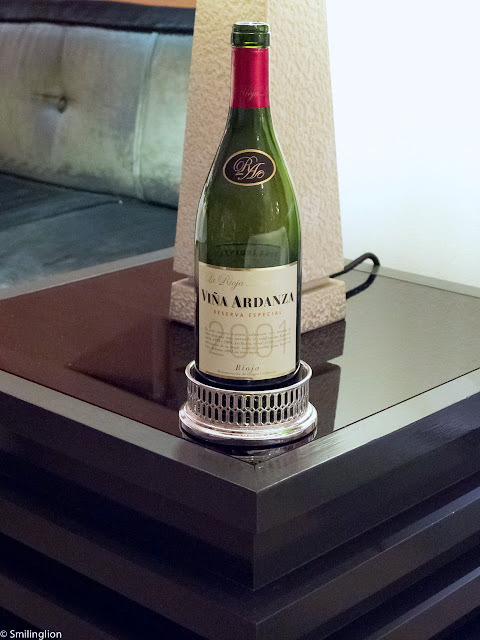 We started with a glass each of a delightful cava, then on the recommendation of the sommelier, opened a bottle of 2001 Alta Vina Ardanza Reserva Especial (a Rioja red). 2001 is acclaimed as one of the best vintages ever for Rioja and this wine was a magnificent example of how good a tempranillo could be. On top of that, it was priced below EUR 60. Despite the mega meals the day before (we had the grand tasting menus at both Miramar and Can Fabes), we felt up for another grand tasting menu as we had skipped lunch that day. 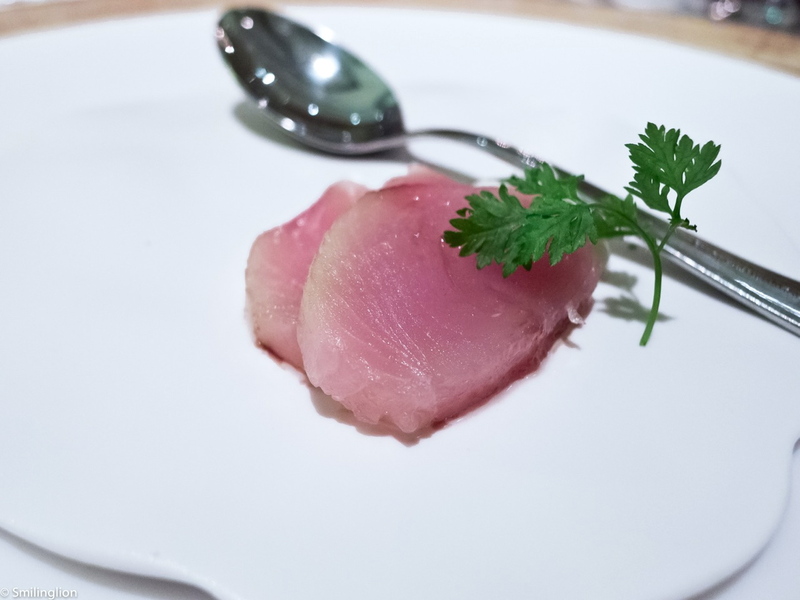 We were started off with some raw amberjack sashimi and a small plate of bite-sized amuse bouche, all of which were quite good. 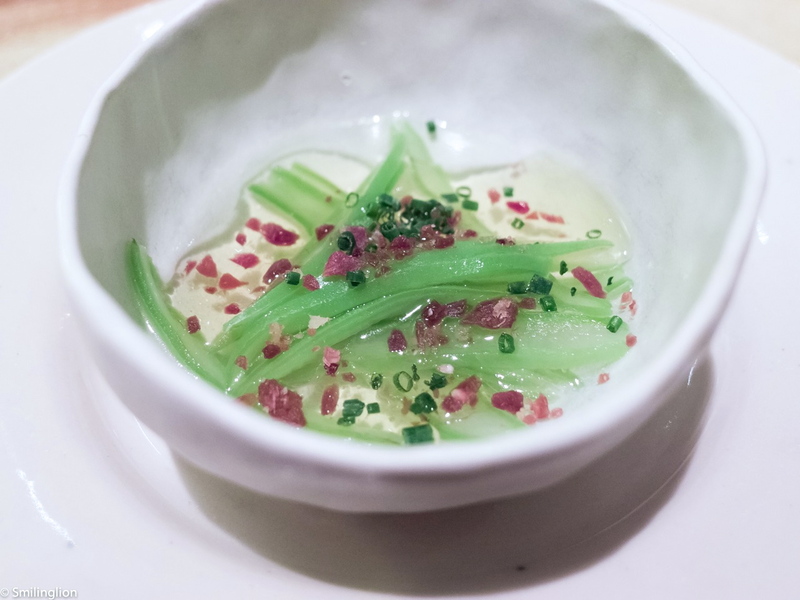 Green beans and jamon with tomato jelly: This was interesting and very nice. Namaras cream with marinated mackerel: Another very good starter, with well balanced flavours. Cold cod with leek soup, grilled onion, red pepper and aubergine: Another subtle but very delicious dish, there was a hint of leek but it didn't overpower the rest of the dish. 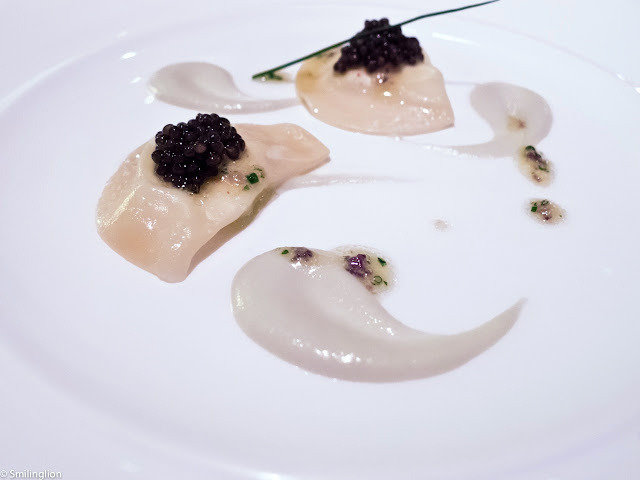 Smoked ricotta ravioli with anchovy, olives and caviar: We loved this dish. It was simple yet divine. Sauteed mushrooms with red prawn and hazelnuts: This reminded us of the prawn ravioli from Can Fabes which we had the night before, though we preferred this more. The mushrooms in this dish were amazing. 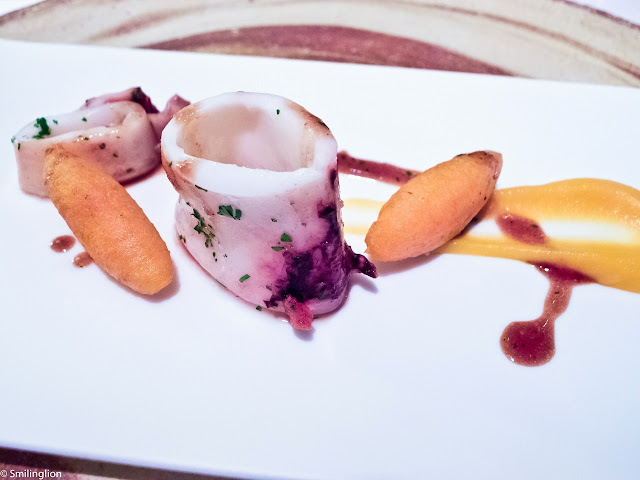 Squid with pumpkin and curry: We hadn't had a bad squid dish during our Spain trip thus far and this wasn't going to change. We thought it interesting with the use of pumpkin and a very subtle curry flavour. It was a traditional Spanish dish with an Asian twist. 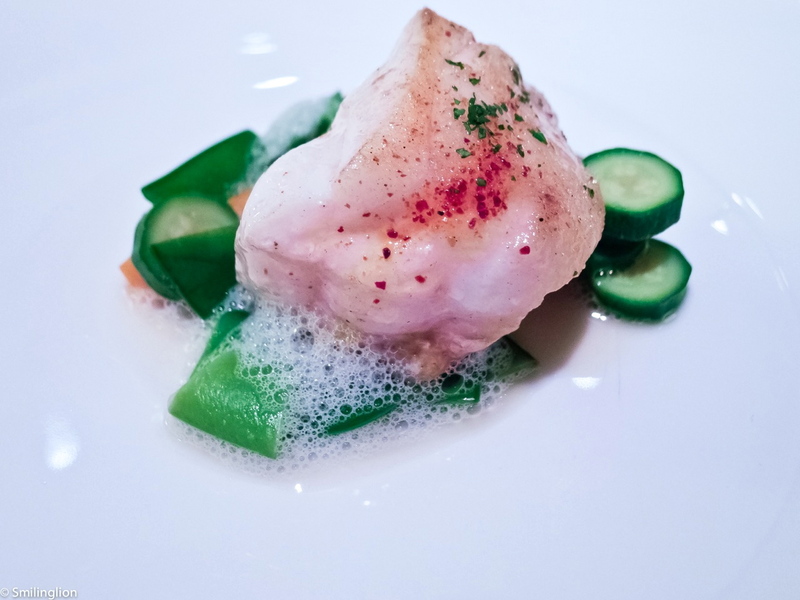 Monkfish with vegetable stew and lemongrass sauce: This was a perfectly cooked monkfish with a complementary crunchy vegetables and a Thai-inspired lemongrass sauce. We loved this dish. Lamb shoulder without bones, and potato and shallot confit: In keeping with the wonderful meal we were having thus far, the lamb shoulder was fantastic. This was done in a classic style with a rich glaze. Before dessert, the cheese board was wheeled to our table. 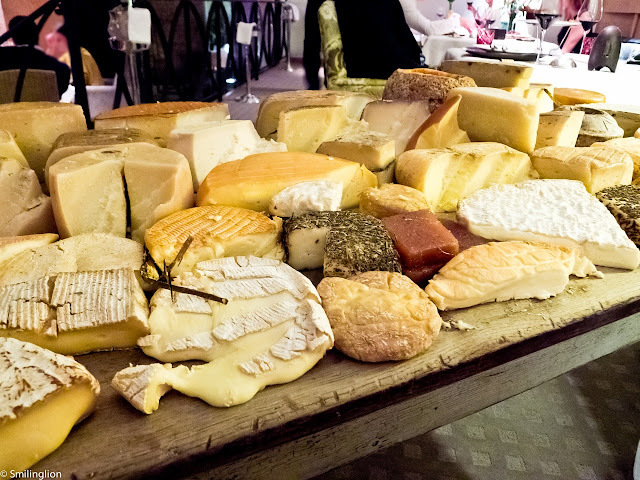 It was the largest cheese board we had seen in Spain and it had Spanish cheeses of all styles. 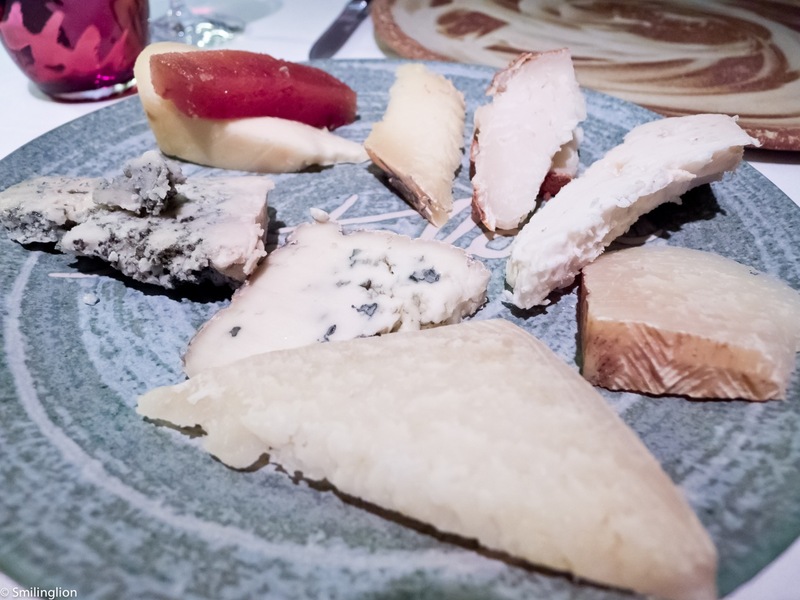 We picked some hard cheeses and some blue cheeses which were very good (though we forgot their names). 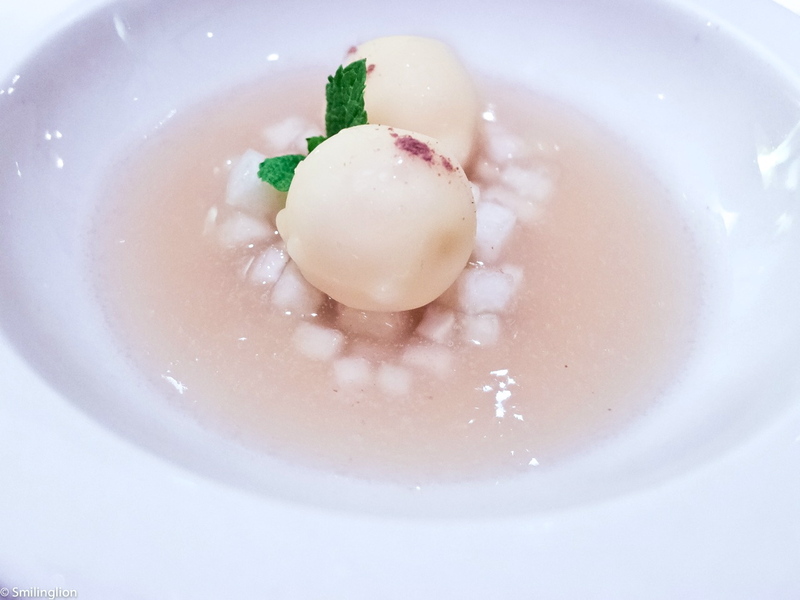 Pear and rhum soup with cinnamon ice cream: We thought that this dessert was very good, it was neither too sweet nor too sour and was refreshing after such a heavy meal. 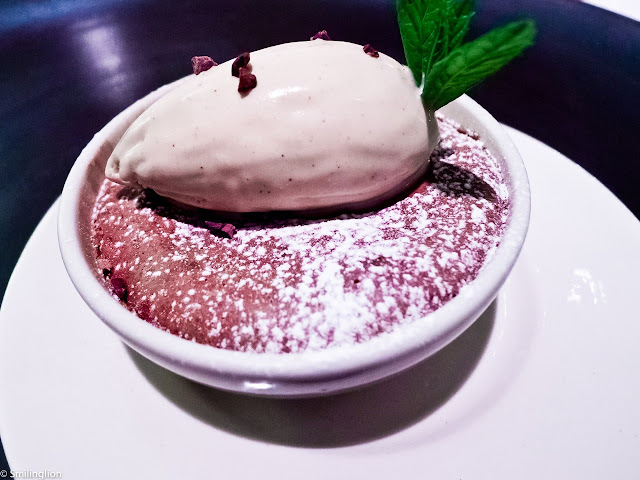 Coffee cream with baked chocolate mousse: The chocolate dessert, though nothing really special, was a classic which was done very well. 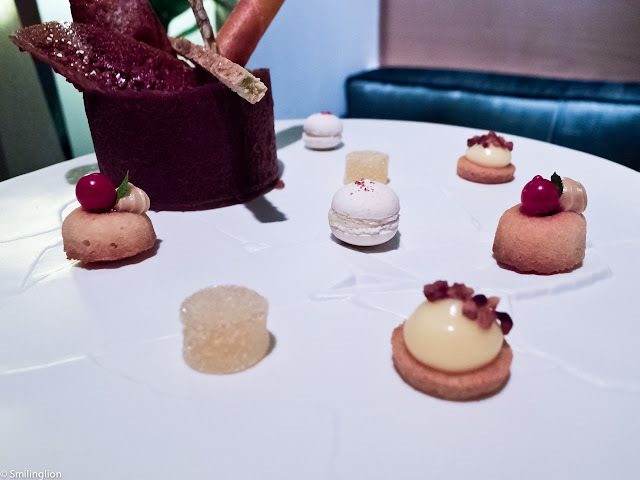 In keeping with our recent experiences, at restaurants where we have had great meals, we tended to finish the mignardises/petit four. Needless to say, we finished everything on the plate here (we noticed that they used a similar 'broken' plate to the one we had seen before at Osteria Francescana). 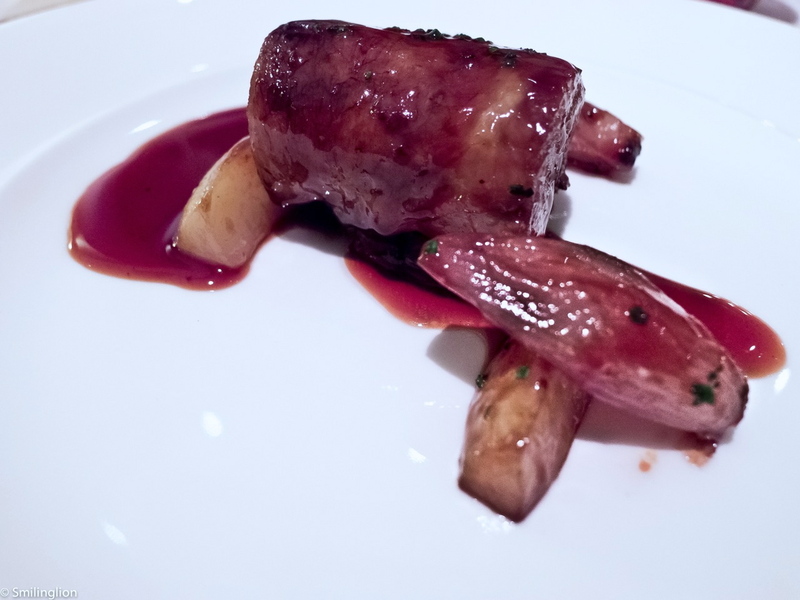 Final Thoughts: This was the meal which we should have experienced at Can Fabes. 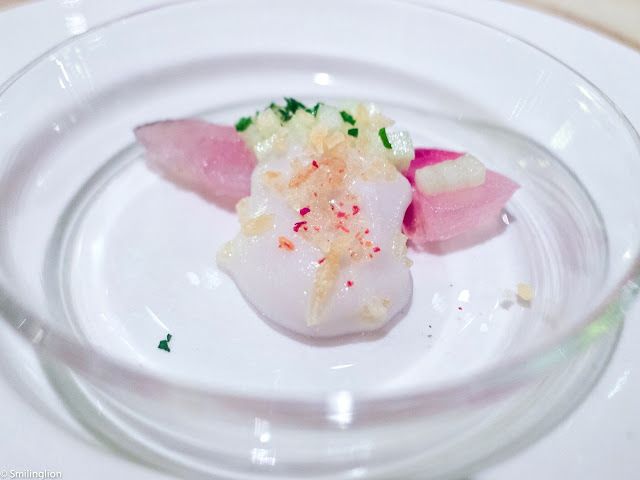 Every single course was confidently and excellently cooked, prepared and presented. Service was spotless and the bottle of Rioja we had was spectacular (and cheap). In many ways, the style of the food here really reminded us of the wonderful meals we had in Santi Singapore (see earlier reviews: Santi 1 and Santi 2), although we thought that this was better. Based on the back-to-back meals we had here and at Can Fabes, we feel that Santceloni has outgrown and outshone its older brother.